Applications are due in April for $2,500 renewable college scholarships awarded by the Chicago Coalition for the Homeless to students who have succeeded in school despite coping personally with homelessness. Graduating seniors from Chicago and suburban schools are eligible to apply, as well as DREAMers, CCH youth leaders, and former CCH legal aid clients who are younger than age 24 as of April 1. Most scholarship winners receive $10,000 to complete their bachelor’s degree. Up to five new winners will be selected this spring. The deadline to submit an online or paper application, with brief personal essays, was Monday, April 1, 2019 at 5 p.m. Applicants were given an extra week to submit supplemental materials. These are due by Monday, April 8 at 5 p.m. These required materials include two references that will be reviewed by our selection committee. 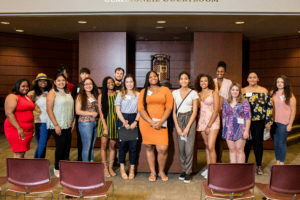 The 2019 scholarship awards event will be held Thursday, June 27 at Loyola University law school, 25 E. Pearson St. (10th floor). To showcase the promise and tenacity of students who coped with homelessness, the CCH Law Project created the scholarship program in 2004. The program was the next step for a legal aid program that focuses its casework on helping homeless students and unaccompanied youth. Patricia Rivera, then director of the Chicago Public Schools’ Homeless Education Program, collaborated with CCH in creating the scholarship, and was the first of the private donors to fund the scholarships. Nineteen scholarship recipients have graduated with bachelor’s degrees, 43% of students eligible to do so. This compares well per a national study that showed in 2013 just 9% of students from the lowest income bracket ($34,160 or lower) had earned a bachelor’s by age 24 (University of Pennsylvania and Pell Institute for the Study of Opportunity in Higher Education, February 2015). During the 2018-19 school year, 17 students attend colleges and universities in Illinois, Georgia and Wisconsin, and historically black colleges in Mississippi and Washington, D.C. The scholarship program’s 2019 event sponsor is Associated Bank. CCH scholarships are funded by private donors and several groups: Associated Bank, The Osa Foundation and Robin Lavin, Susan W. Pearson Memorial Fund, and the Student Alliance for Homeless Youth, led by teens from North Shore high schools. The program also benefited by prior grants from the Alvin H. Baum Family Fund, Sisters of Charity, BVM, and a $10,000 challenge grant from Elaine’s Hope, funded by the late educator Rhonda Purwin. More information, including detailed eligibility guidelines, are available here. Contact Intake Specialist Christy Savellano for more information.